Professor Ravi Selvaganapathy and a team of McMaster researchers are developing a new way to use additive manufacturing to create artificial tissues. The team’s research was featured in Advanced Healthcare Materials in March, an international, interdisciplinary peer-reviewed journal that explores the intersection of materials science and human health. Additive manufacturing, casually known as 3-D printing, involves depositing many successive layers of a material to create a three-dimensional object. In tissue engineering, a scaffold material – usually a polymer or gel – that contains living cells is laid down in layers, eventually binding together and creating usable tissue. 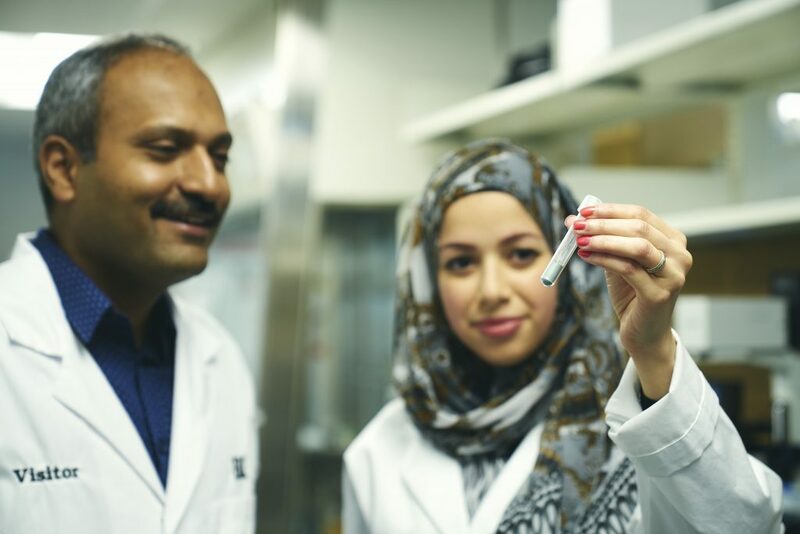 Selvaganapathy and his team, including postdoctoral researcher Rana Attalla, have been exploring the possibilities of using a lamination process for creating tissue – a technique that involves laying down a thin layer of material, cutting it into shape, and gluing it to the layer beneath. Subsequent layers follow the same pattern – layer, cut and glue – until a three-dimensional structure is built. There was one problem: for many types of engineered tissues to function, channels that mimic natural tissues’ vascular systems need to be embedded. These carry in nutrients and oxygen, and take out waste. Without these channels, the tissue dies. Selvaganapathy’s group was making layers with channels molded into them, which could be used as a perfusion network. But with the type of laminated technique they were developing, the tissue layers needed to be glued together – and while tissue glue exists, it’s a liquid. Spreading it on layers of tissue meant those vital channels soon got clogged. The team was stumped, until it occurred to them that using nanoparticles – which are solid – might be a better approach. That was one step in the right direction, but soon there was another problem. The nanosilica particles needed to be used in such high concentrations – approximately 50 per cent – that they also ended up clogging the vascular channels. Eventually, the team determined that another nanoparticle, silicon carbide, would adhere just as well, and could be used in such small concentrations that there was little danger of clogging. As an added bonus, the silicon carbide, unlike nanosilica, was virtually harmless to the tissue around it. In the short term, this type of technology can be used in drug testing: rather than culture tissue in a flat petri dish, researchers can instead create a three-dimensional structure – which better mimics the structure of the human body – to better assess how cells will respond. Further down the road, this type of technology could be used to create “in-vivo bioreactors” – that is, a structure within the human body that could be used to amend the function of an existing organ. For example, cells could be engineered to produce insulin, then embedded within an artificial tissue structure, which could then be implanted into the body of someone who is diabetic.